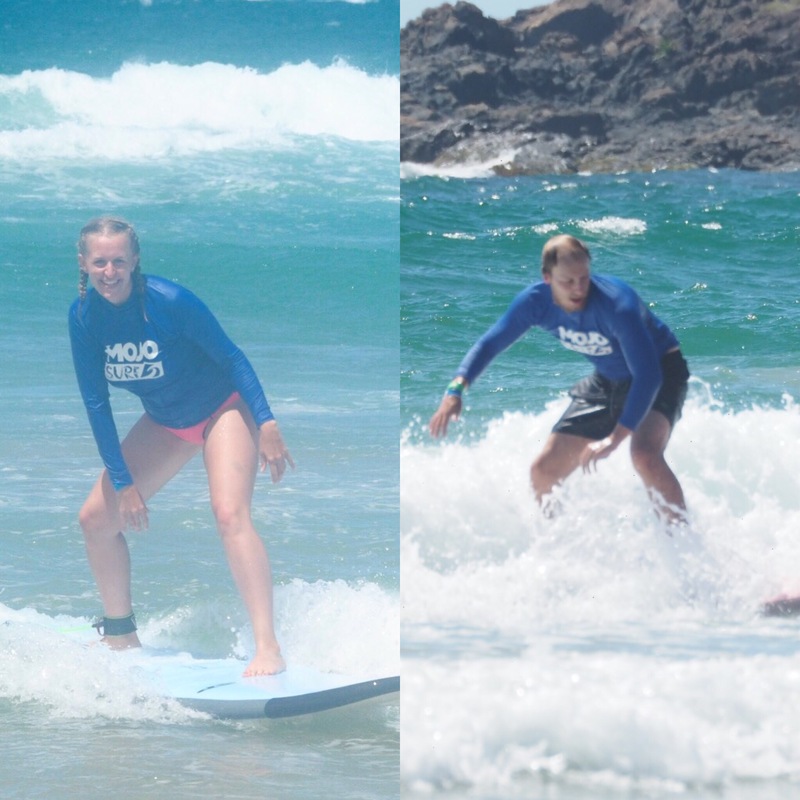 Being in Australia, the home of surfing, we had to give it a go ourselves. 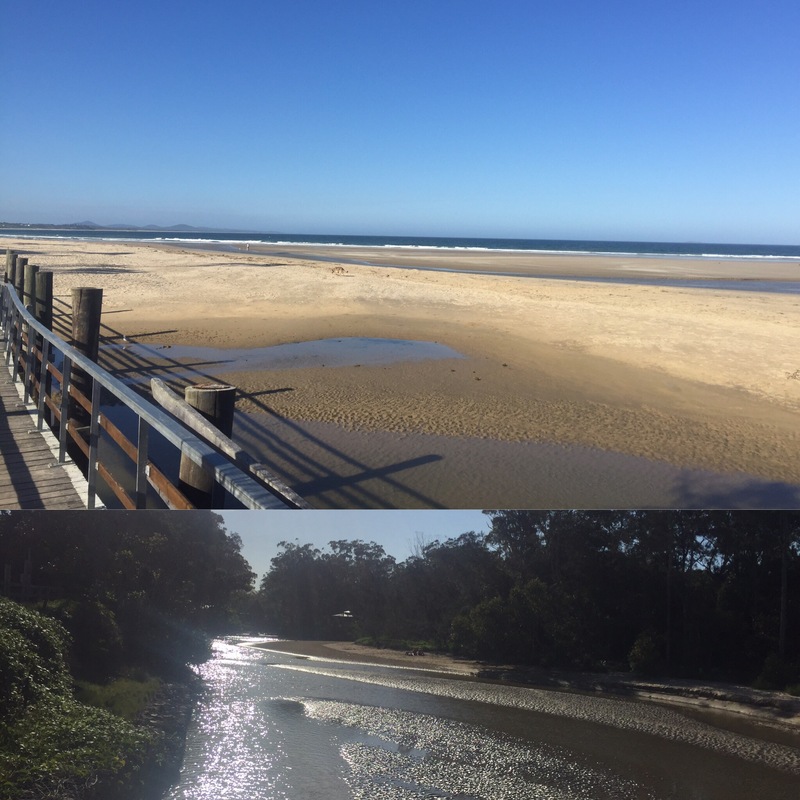 We decided to go to a 5 night surf camp called Spot X which is on Arrawarra Beach near Woolgoolga. We chose here so that we would know how to surf before heading up the east coast. The camp is pretty remote so we were picked up from the bus stop with some other people we would likely be having lessons with. The camp itself was pretty big with storage containers as the bedrooms (which had air con!) and a big communal courtyard where you’d spend your free time. We got a tour from a lovely girl from New York called Julia who showed us around, told us about the offers they had for photos and merchandise etc. and told us how to find out the times of our lessons. We had all our meals provided and they were all really tasty! There was also loads of salads and fruit which was just great especially when we have been on such a budget with our food so it’s probably the most balanced diet we’ve had whilst we’ve been out here! 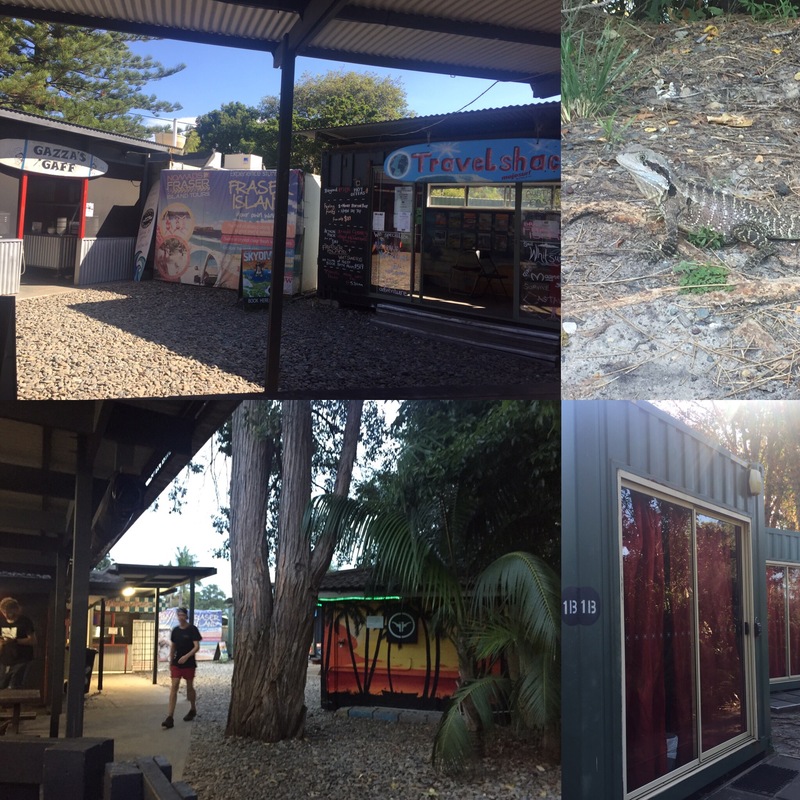 The camp also does a bottle shop run each evening which is quite funny because the bottle shop hires the bus for everyone to get there because they get so much business from the camp! On the first evening we went and bought our drink and spent the night chatting to our new friends Martin and Naomi who we had met whilst having our tea. The next day (2nd February 2017), at 10am, we had our first surf lesson. 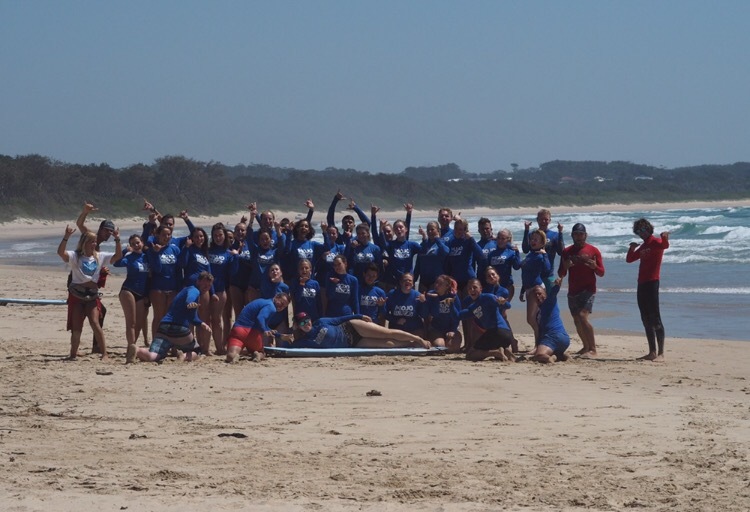 It started with a surf talk about the types of waves (spilling or dumping waves), surf signals that the coaches might give and the dos and don’ts of surfing before we were given our surfboards and a surf top (called a rasher) to wear and headed onto the beach. There was also a photographer that comes out with us to get pictures of us riding the waves (if we can stand up!). 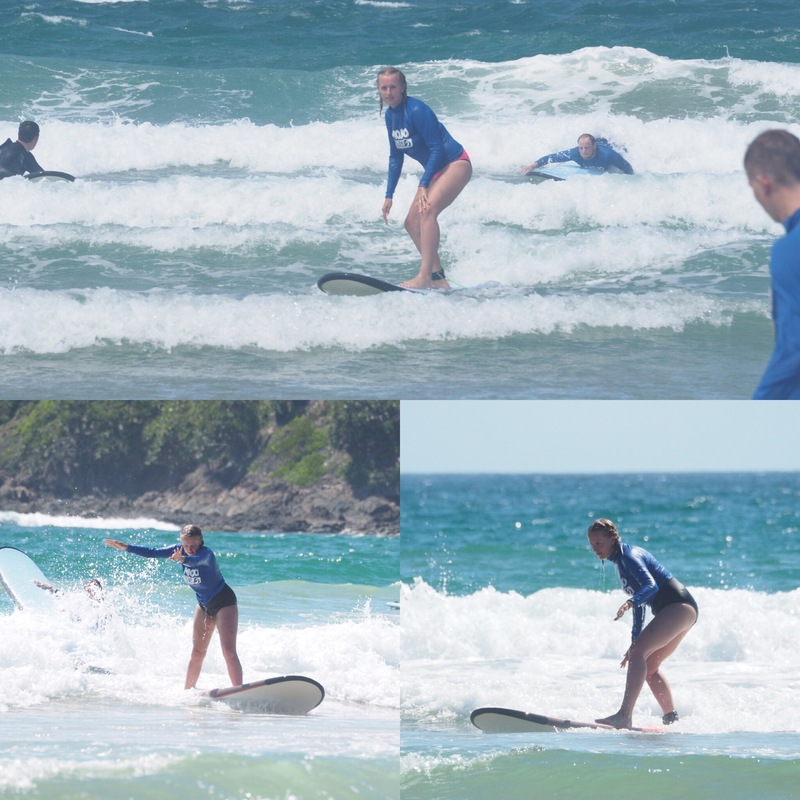 Our first lesson was a split between being in the sea and on the beach as we had to learnt the fundamentals of surfing such as getting up onto our board. We had to draw around our surf board to make a sand board to practice the motions of surfing. Once they felt we had the hang of it, we were split into smaller groups so that the coaches would be able to give us the attention we needed when out in the water. Our coach for the day was called Kate and she was good at helping you get that first wave. Once you were out it was just a case of trying again and again to catch the wave. We both stood us a couple of times in our lesson which is such a good feeling! The coaches were really good at watching and critiquing you so that you would improve and they help you ride the first wave too so you knew what you were doing. 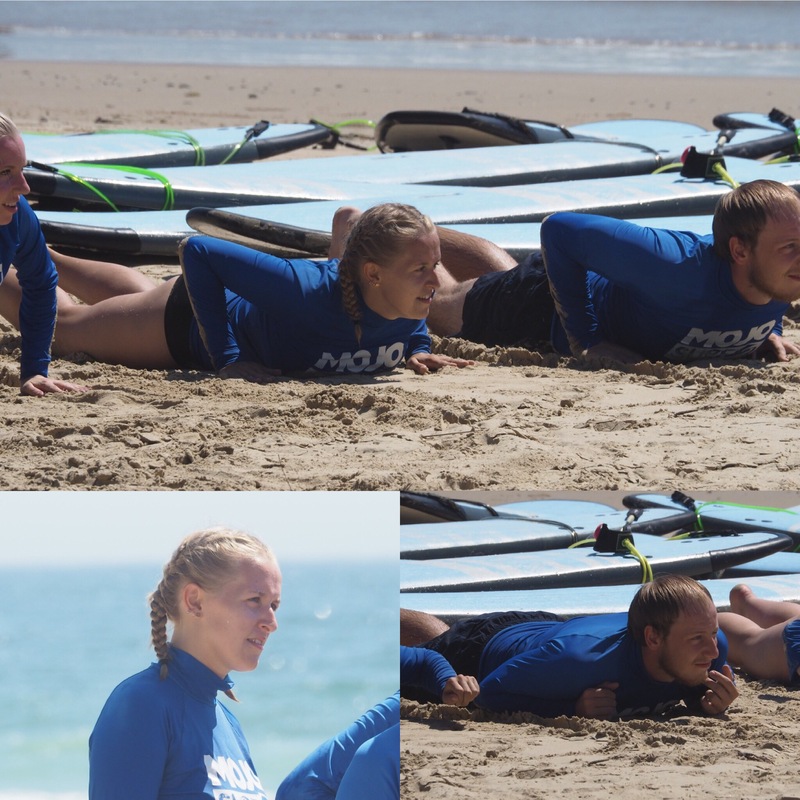 We bought a surf package where you get merchandise (we got two vests which are so comfy and good for being on the beach), all your photos from the lessons and activities, extra surfing time with an instructor and unlimited surfboard hire all week. 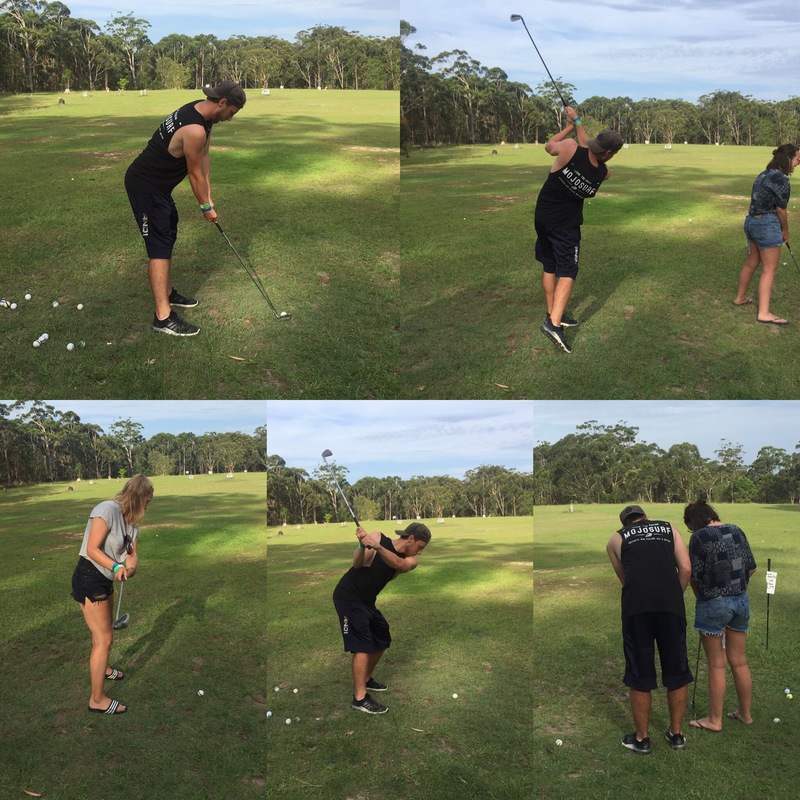 We also had activities such as kangaroo golf, rafting and kayaking which we could do when we weren’t surfing. 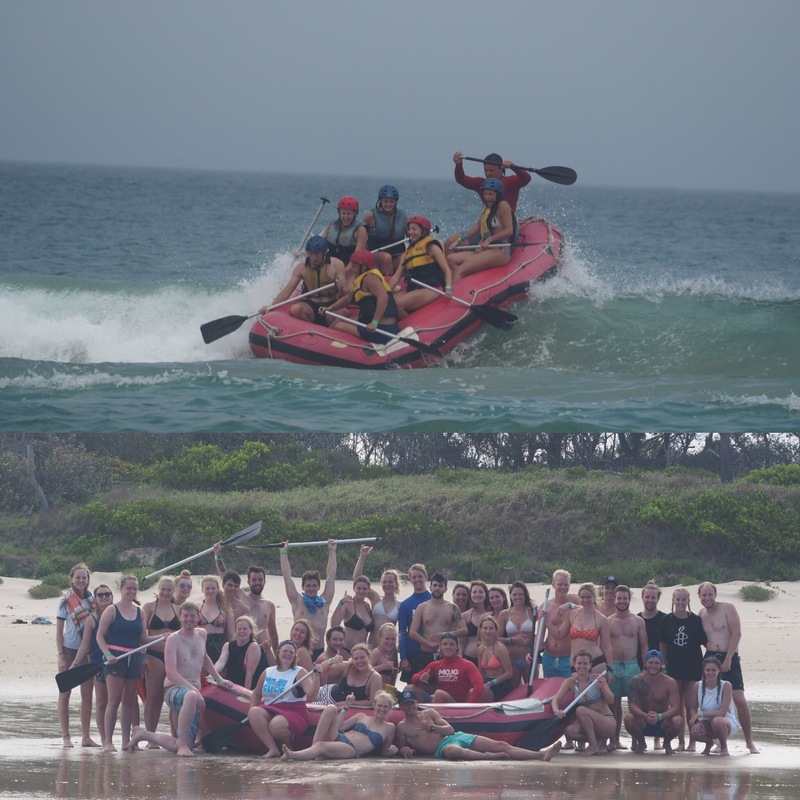 The first activity we did on our first day was ocean rafting at 5pm which was really fun. Because of how many there were of us we were only out for 15 minutes but we got crashed by loads of waves and one huge one crashed over us all and washed us into a heap on the raft which was really funny – we couldn’t believe no one fell out for that wave. The instructor and Martin were the only two that fell off the raft. It was a lot of fun and we’ll hopefully get to do it again some time. Our second day of surfing was really good! We were both a bit stiff from the previous day but they did warm up game of catch the flag which sorted that out and then we went out to surf. Our coach was from France and had surfed in America and was called Matthew. He was a really good coach and was very attentive (we had smaller groups today which also helped) and so we were able to progress quite a lot. He told us how to turn on the surfboard so we were able to practice that in our afternoon lesson (you turn your body and look the way you want to go and transfer your weight slightly to help you turn). 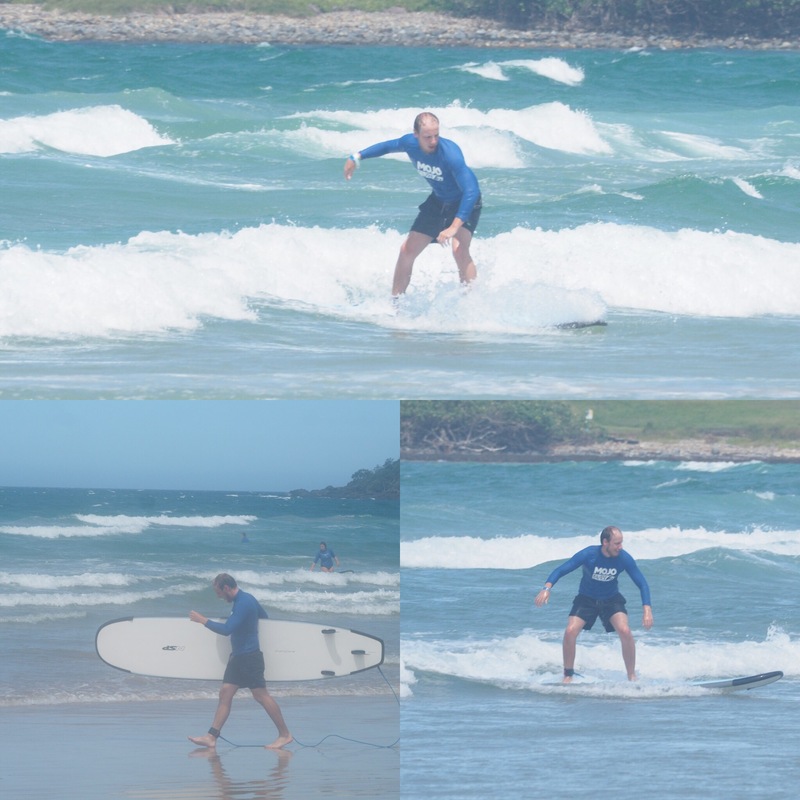 In my morning lesson I had some pretty big wipe outs – one of which really winded me – but it’s all part of it and you just keep going, hoping to catch the next wave. When you catch the wave you forget that you fell off so much! The second part of the day was a bit harder as there weren’t as many waves to catch and loads of us were out there in a small area so sometimes you’d be ready for the wave and someone would be in the way so you’d have to get off your board to make sure you don’t hit them which is always really frustrating – it happened to Niall a lot and it really does drive you crazy! 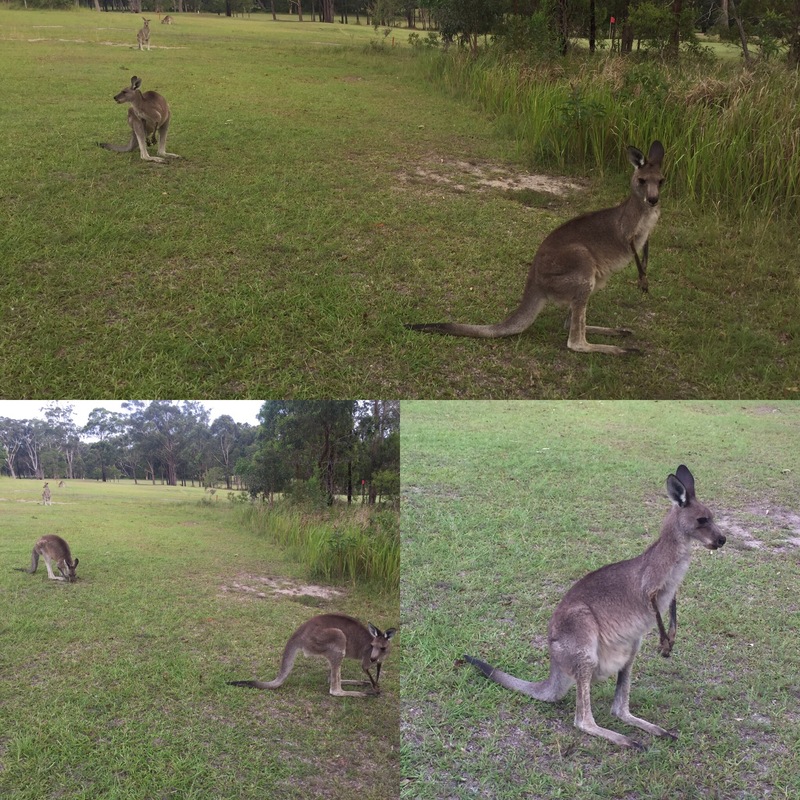 In the evening before lunch we went to ‘kangaroo golf’ which is really just a driving range with kangaroos on it. 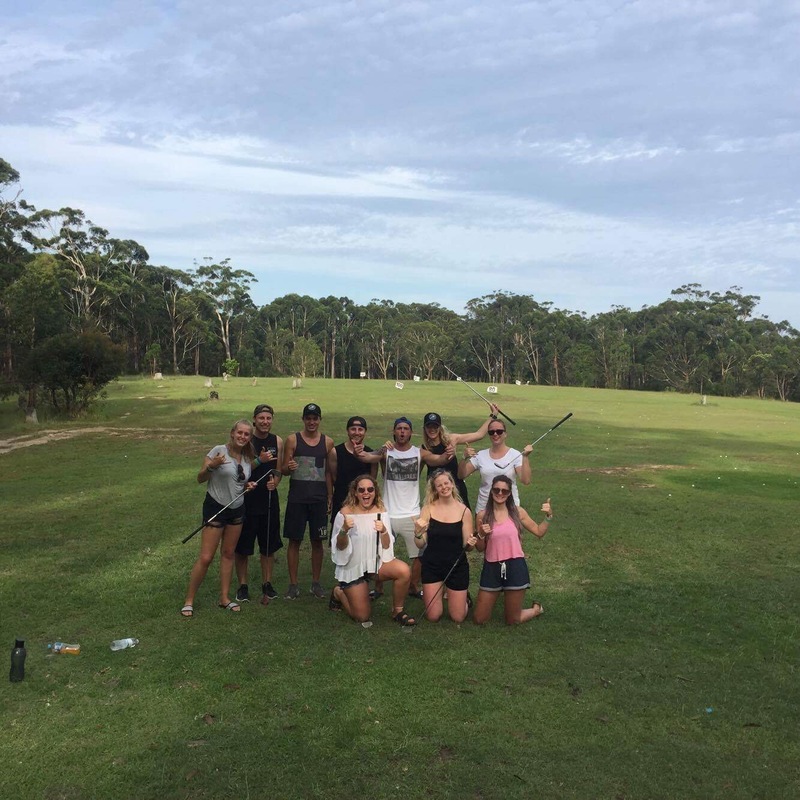 Niall enjoyed getting to play some golf and I enjoyed the kangaroos so it would probably be a good regular hobby for us to come here if we ever lived somewhere like that. Niall also helped some other people learn how to play which was nice of him. It’s a nice group at the surf camp too so was a good activity. 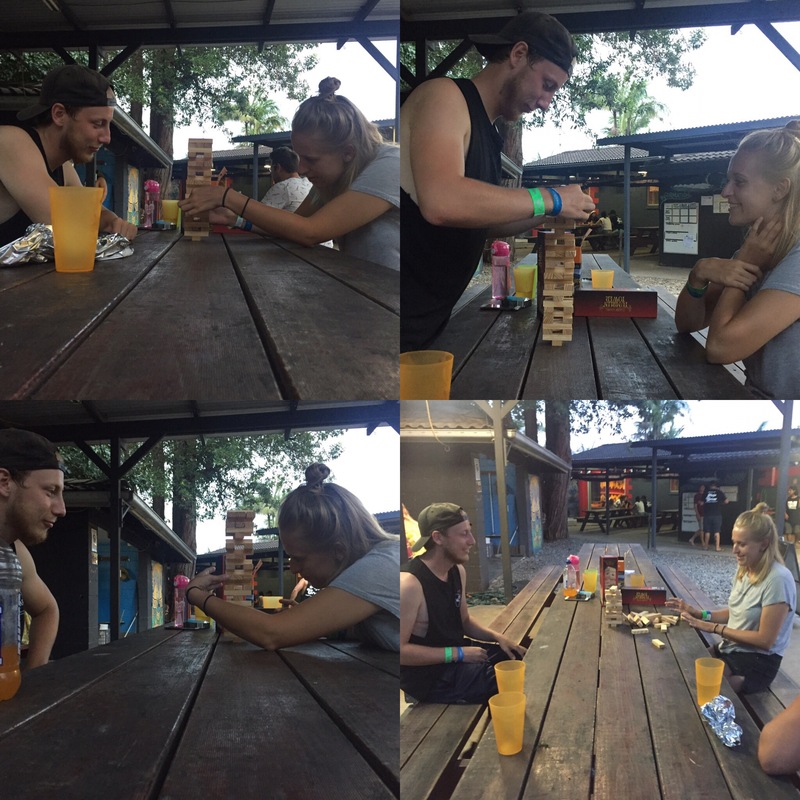 After another good tea me and Niall played a very intense game of jenga which went really high and it came down to there being no moves left that could be done without tipping the blocks. It really meant whoever had started had the upper hand and wouldn’t tip the blocks. Unfortunately, I lost which is a shame because Niall losing is a lot funnier with how competitive he gets. 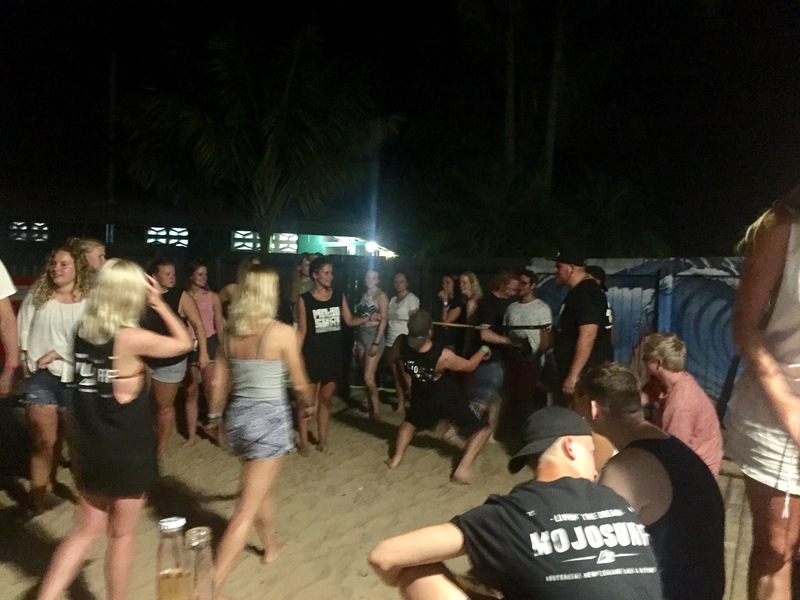 That evening, the camp put on games to keep us entertained including a game of limbo which our roommate, Roman, won and a game of musical statues. After that we went to the beach. The sky was incredible a there is no light pollution there – something I will never get tired of seeing when we go to beaches at night. One issue we had with our room was that there were cockroaches. I managed to catch one and then we had to stop the rest from coming out by stuffing wet tissue into the gaps of cabinets they ran into. We could only hope that it would work. Our third day of surfing was a hard day. The waves were really hard to catch and you got wiped out a lot. In the evening we played a game called heads up which is an app on your phone and can be really funny. 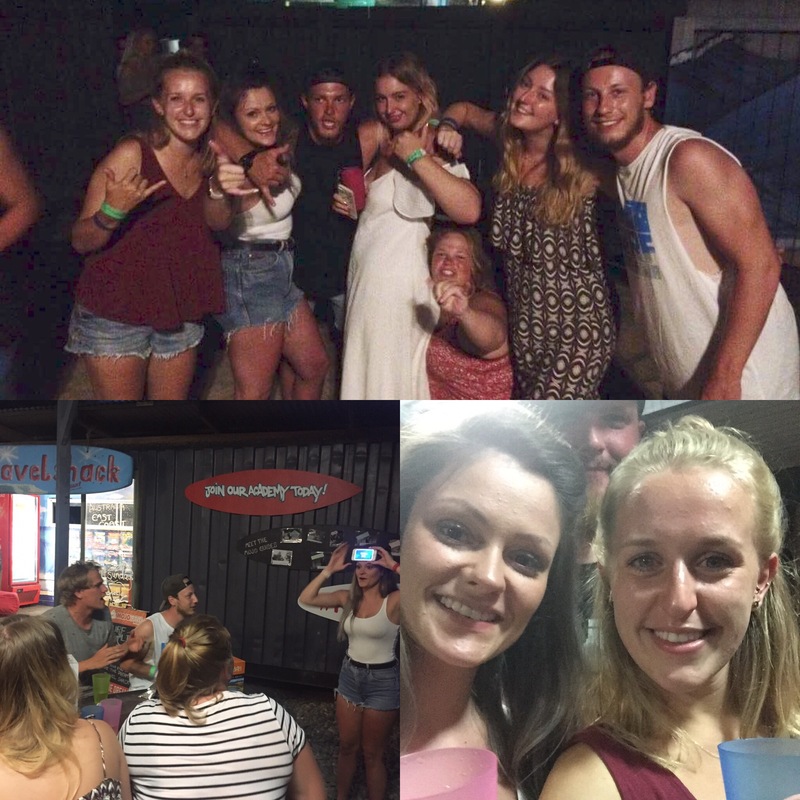 We then spent the night drinking, dancing and talking. The dancing takes place in the ‘sweat box’ which is their lounge that they empty and it gets super hot in there which is why it has that name. At around midnight me and Niall went into the sea to see the photoplankton which was incredible. When you moved your feet around in the water it would sparkle and glisten like little diamonds which was so cool to see! On the fourth day of surfing it was another wash out for me but Niall got some good waves. We were practising green waves (waves that haven’t broken yet) so it was a very hard lesson. In the afternoon the lesson went a lot better and we both rode some waves. I managed to ride some waves all the way into the beach too which was an incredible feeling. Niall was doing really well too and focussed a lot on practising his turning. While Niall napped I went on a walk along the beach with people from the camp to get a milkshake from a campsite cafe. I went with a girl called Chloe who is in our surf lessons. 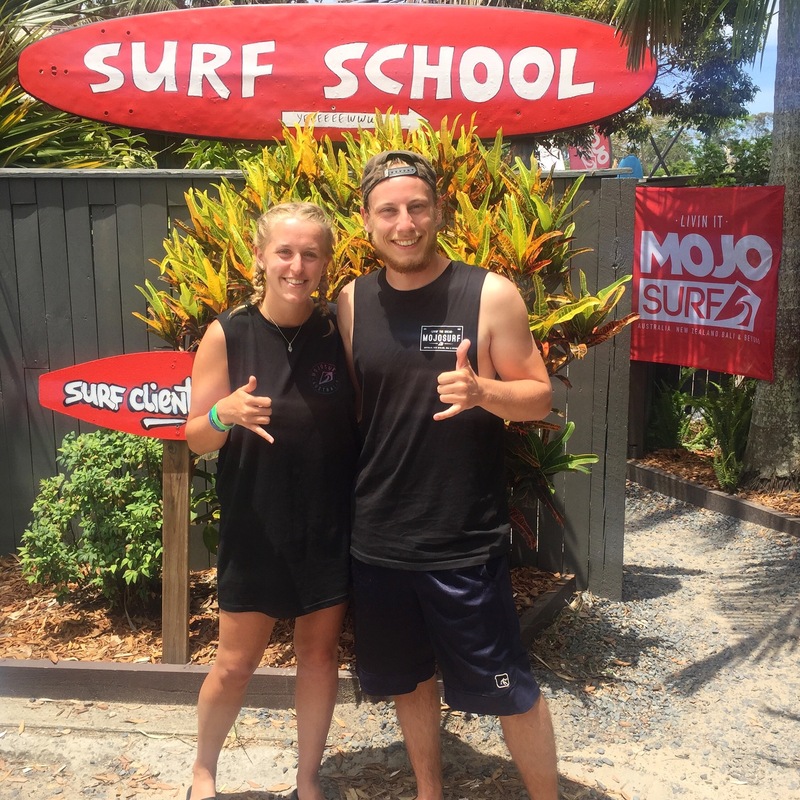 She’s really nice and helped me catch a wave on the morning lesson when I was about to give up trying! 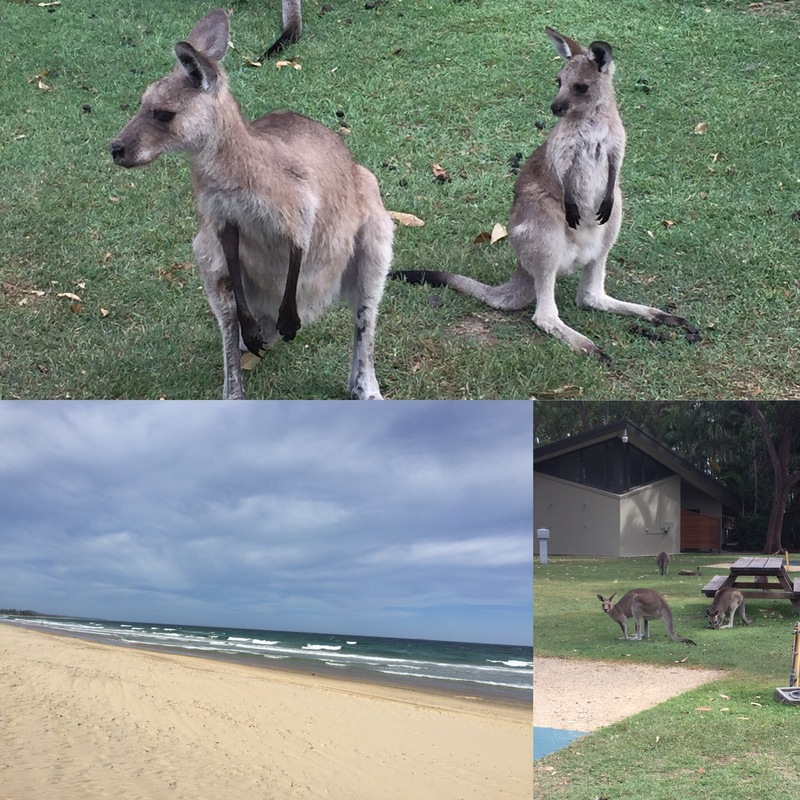 Along the way we saw kangaroos including a little joey which was really cute. 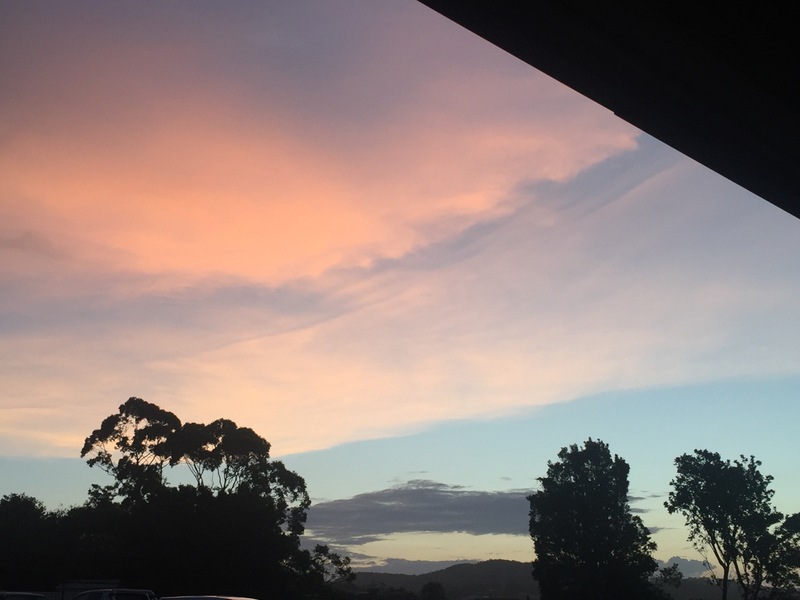 Our last day at camp was a half day before we caught our bus to Byron Bay. 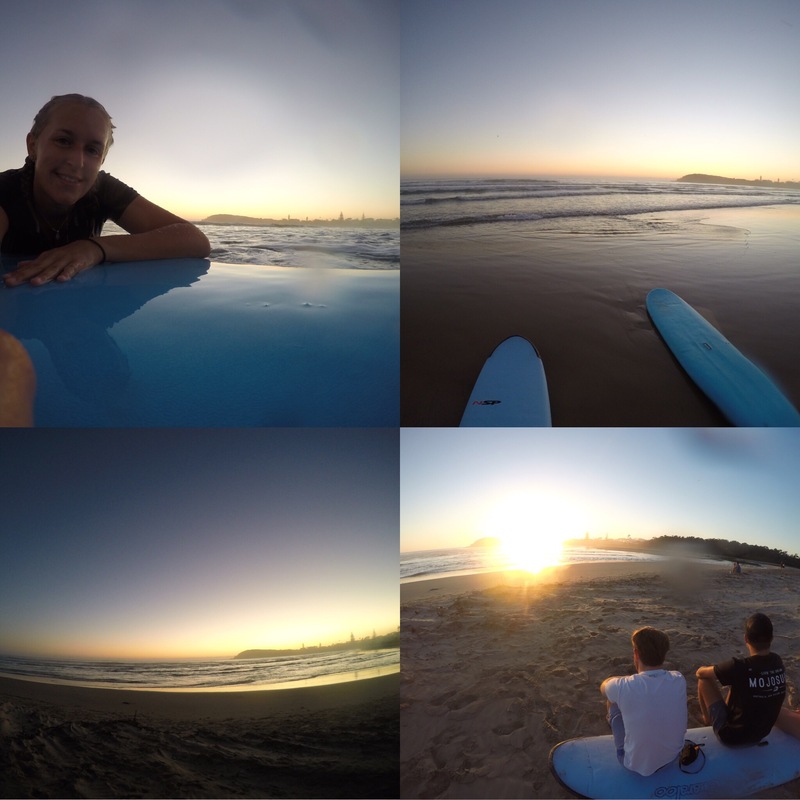 We started the day getting up at half past 5 in the morning to do a sunrise surf. There wasn’t really any waves but the sun rise was really pretty and Roman from our room took some cool pictures of me and Niall on the beach which he kindly sent to me. We then had our last lesson which went well. The waves were the biggest they had been so I focussed on catching waves I had already done and Niall caught some green waves with the help of the instructor. It was a really fun but hard lesson. 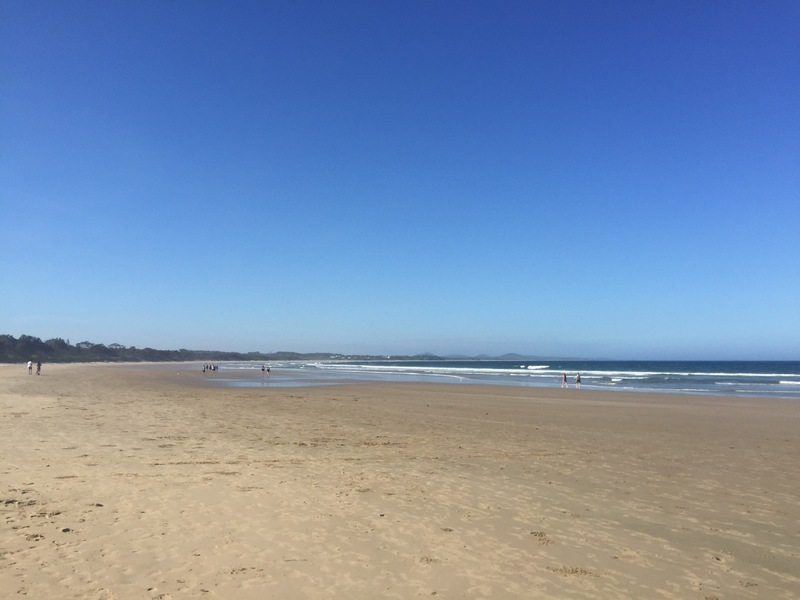 We were really battered and bruised from surfing with scraped knees and I had a bruise on my hip the size of my fist – something I hadn’t anticipated from surfing. During lunch we watched the super bowl including the half time show which had Lady Gaga performing – she was so good! It was the first Super Bowl game I’d ever watched and the first Super Bowl game in history to go into overtime! I honestly couldn’t recommend this place enough. I think it’s worth coming for the 5 days so that you get plenty of chance to practice with the coaches and improve your surf skills. As we are heading up the east coast it means we’ll be able to hire boards and surf all the way up which will be brilliant (if the waves are alright). When a surfer catches a wave they say ‘yewww’ and do the ‘shacca’ which is your thumb and little finger out and the three middle fingers closed and you’ll see people do it loads to each other when they get a good wave!